Here’s a recap of 5 fantastic minis for July. Just click and see what we’ve been up to! And, if I have missed anyone this month, please let me know. I have finally fixed the Blogger e-mail problem – after 3 tries! 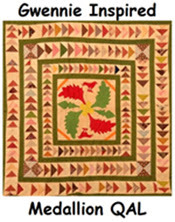 Kyle’s (Timeless Reflections) July quilt is right in season! Janet (Rogue Quilter) is mad for plaid with her adorable July mini. Barbara's (Quilts, Gravestones and Elusive Ancestors) little quilt has an interesting story attached! And Randy (Barrister's Block) couldn't remember if it was her June or July quilt, but is so cute that we just don't care! Do check them all out! Our state show - Maine Quilts 2018 - was last weekend and although everyone who volunteered is exhausted, we had a ball! It was a great show and as I mentioned in my last post we had a very special exhibit of Marjorie Lydecker's stunning quilts. It was simply fantastic to see so many of Marge's quilts in one place. Aren't they amazing? I tried to chose a favorite, but I couldn't. I loved them all. 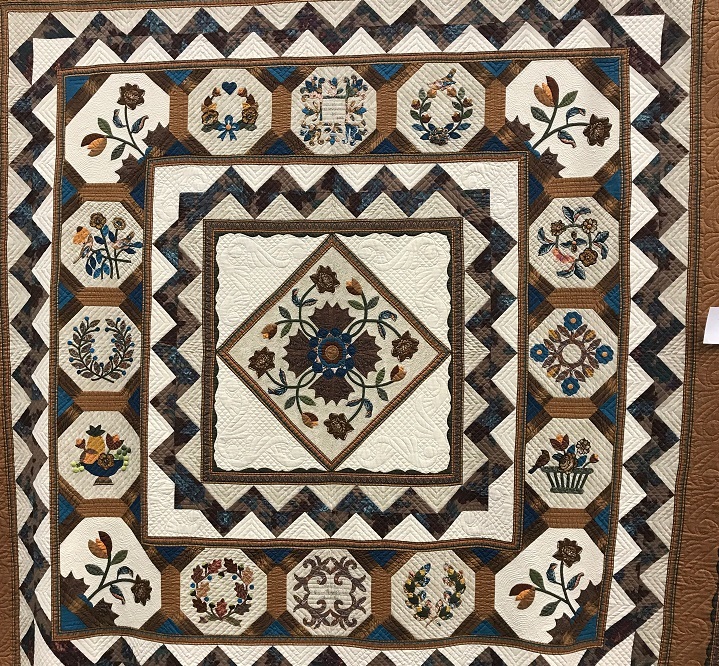 I did not get any great close ups, but Gladi (Gladi's Quilts) did and I highly recommend you pay her a visit to see the details. Thanks Gladi! I also enjoyed assisting Amy Milne (Quilter's Alliance) with her interviews, "Go Tell it at the Quilt Show". Each person was given up to 3 minutes to talk about the quilt they chose to bring. It was a wonderful experience for me to watch and I will post more on the participants later. Marge did her 3 minute talk in front of her quilts. I cried as she described this blue and white quilt that she made for her 50th Anniversary. She is such a treasure! I didn't put anything into our judged section this year, but Pat Harrison gave me a NACQJ award anyway. What an honor! It was for my "Gooseberry Pie" potholder quilt that I made in the (Foothills) quilt sew-a-long with Mary Elizabeth Kinch. I finished my July mini last night. I wanted something really quick and easy for such a busy month. Can’t get much easier than 3” finished toiles with sashing. I like the way it turned out though. And, best of all, it’s finished before the end of the month! I love that Betsy Chutchian blue border fabric! It is from her Rachel Remembered line. 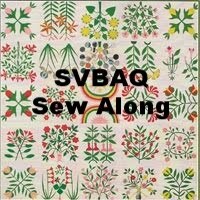 If you are in New England over the weekend I’d love to see at our state show (Maine Quilts 2018) at the Augusta, Maine Civic Center. It is always a good show. 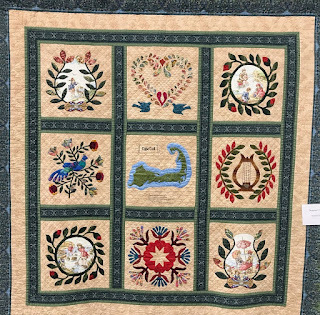 There are a number of special exhibits this year including some wonderful antiques from the New England Quilt Museum, “Specimens” by Susan Carlson and “Not Patience, Perseverance” by a very special friend, Marjorie Lydecker. 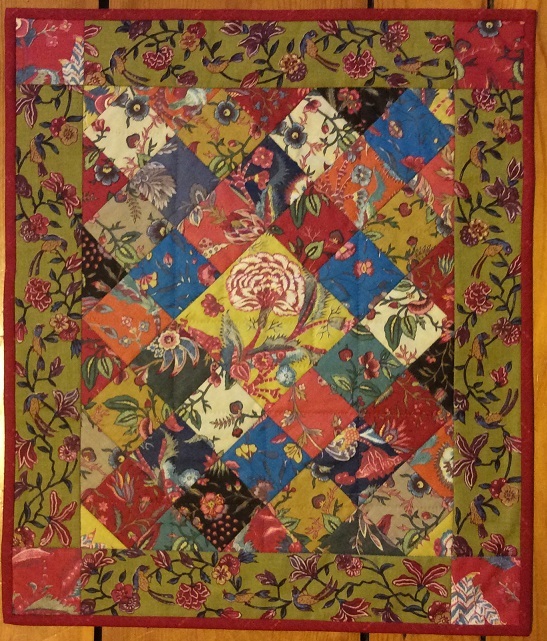 I cannot wait to see many of Marge’s spectacular quilts all in one place. She is one of my idols! 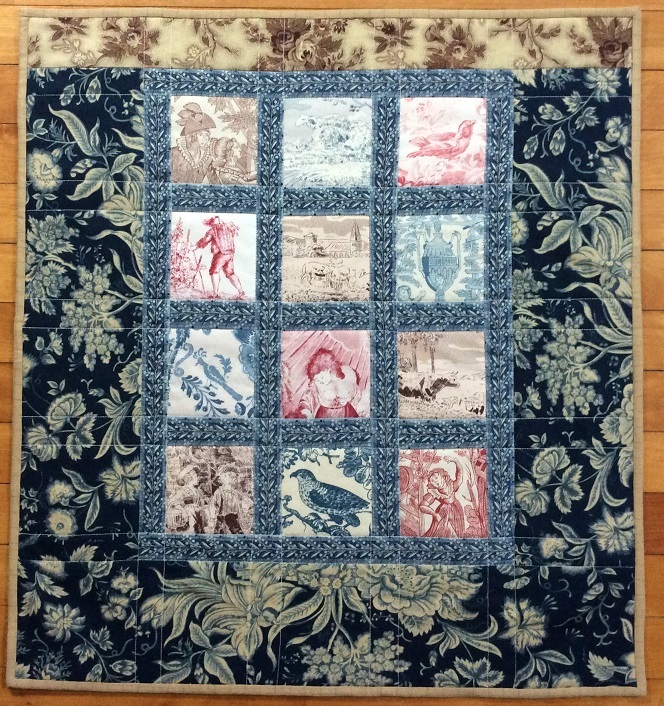 I have three quilts in the show this year. I finally finished my “Quilty 365” quilt so it will be there along with 2 potholder quilts. One of the things I love about our show is that our “judged” section is separate from the rest of the show. 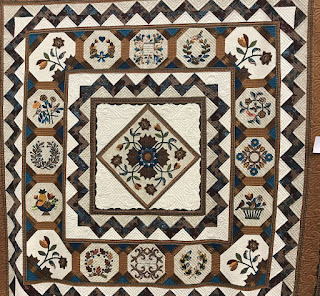 I think many people (especially new quilters) would be intimidated to have their quilt judged and I like that we encourage all quilters to enter their quilts. 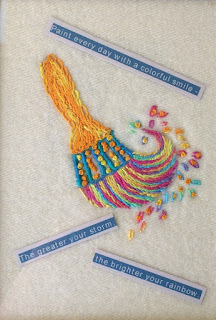 I love seeing first time quilters join in the fun! So, I hope you get a chance to stop by! 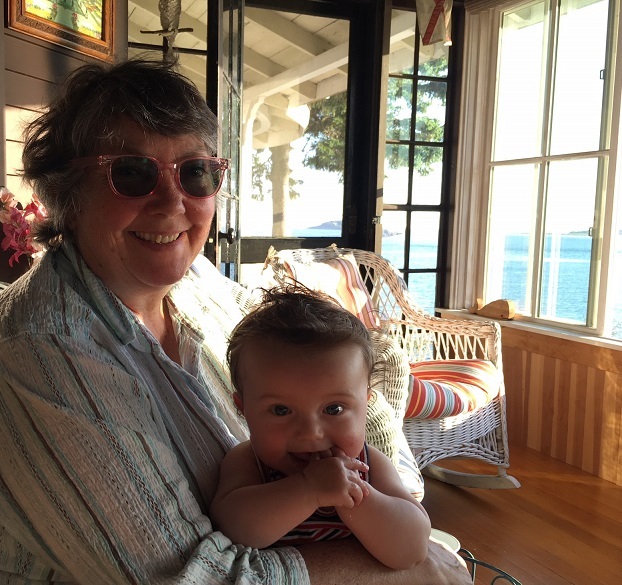 Between 10 glorious days with family and then a week without internet, I am way behind on my Blogging time. And, I am still not getting e-mails from Blogger. I have tried all the suggestions so I may have to go back to square one. If I don’t respond to your comment, it is because I haven’t received it. I’m hanging by a technological thread as it is. If it ain’t broke, don’t fix it!! 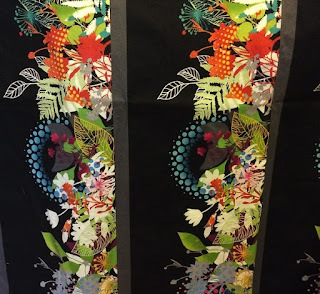 I have been working on three secret sewing projects so I don’t have a lot to share in my great come back post. I have done a bit of sorting of my feedsack collection and found a number of them with logos printed on them. Some of the manufacturers numbered their designs. The number stayed the same with each different colorway. It’s always fun when I find a new one. 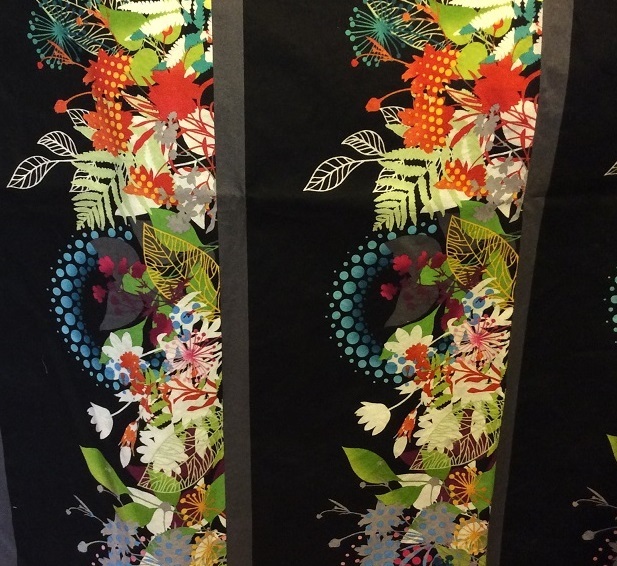 This fabric is part of one of my secret sewing projects. 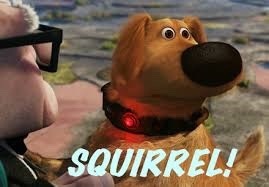 Isn't it wild? Stay tuned! June minis better late than never! I can’t believe how June flew by! I pieced this little top at our retreat using some of my favorite Dutch fabrics. We've all been busy this summer and I have no single excuse for being so late in posting. I apologize to Janet, Kyle and Barbara for taking so long to post their June minis. Janet's (Rogue Quilter) little gem has a distinct patriotic flavor. Love it! 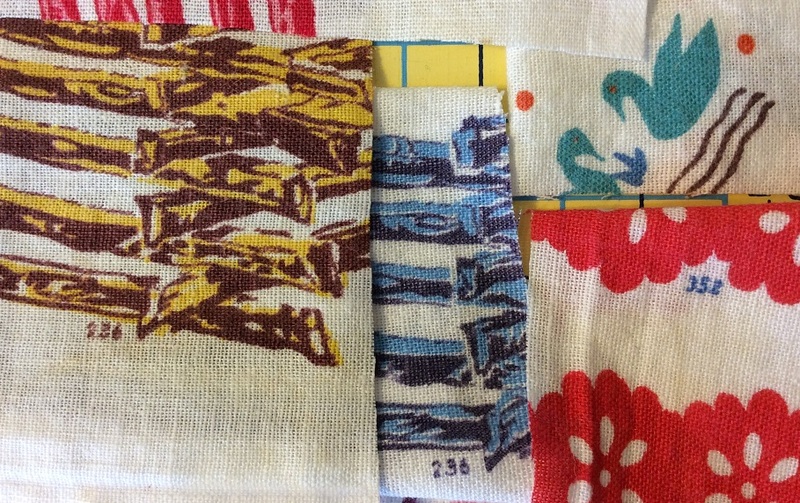 I love how Barbara (Quilts, Gravestones, and Elusive Ancestors) incorporated selvedges in her June mini. Kyle (Timeless Reflections) used some very sweet vintage flower garden blocks to create her mini. Adorable! I neglected to post a photo of this little gem that Christina (Tina) made for me. She often comes up with little surprises! A while ago, she had asked "the sistahs" for our favorite colors. 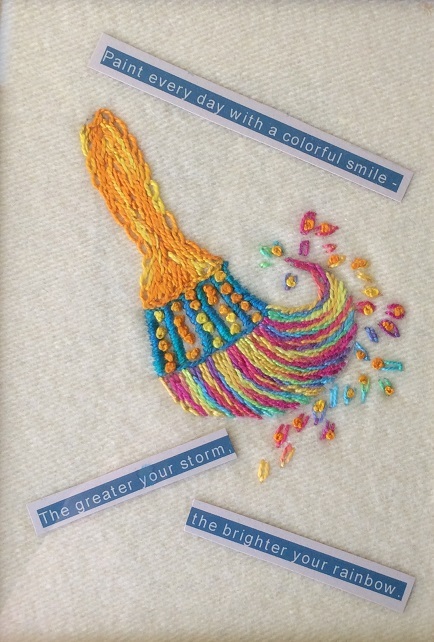 When we arrived at retreat, she gave each of us one of these special hand embroidered pieces in our selected colors. A few of us had experienced some tough times in the past weeks so the saying was particularly appropriate! We spent 10 fabulous days in this magical place where my husband's grandfather was born. It was hard to say goodbye to our son and his family and it has difficult getting back to reality!